Koels are shy and elusive birds. They tend to hide behind the thick foliage of fruit trees, hoping no one notices them while they eat their fill. The slightest hint that they are being watched causes them to fly off and find a more remote spot. We've been quite successful in encouraging these birds to step out of their shells and be photographed. 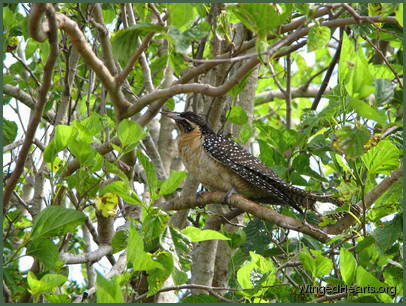 This female Koel is one of the birds whom we spoke to gently and she obliged by showing herself. The techniques we use to communicate with wild birds that visit our yard are part of the general culture we've created in our yard for communicating with the freely living birds.